The idea behind Project Ara was simple: when an improvement in a phone component, say the camera, would become available, instead of having to buy a new phone, users could swap in a new module. For consumers, it sounds like a great idea: lower cost for improvements to the phone, longer phone lifespans, easier repair, less waste (products that had modules break would not be entirely discarded), and a framework for mass customization. From a business model point of view, Google could enable an ecosystem where modules could be provided by multiple third parties, collecting platform rents and expanding the market to potential nonconsumers on the basis of price reduction and customization. Project Ara was billed as the modular phone. Google stated that Project Ara was being designed to be utilized by six billion people, including one billion current smartphone users, five billion feature phone users, and one billion future users not currently connected. Google planned to launch for developers in late 2016, with a target bill of materials cost of $50 for frame, display, battery, low-end CPU and WiFi, and the product would be available for consumers in 2017. However, on September 2, 2016, Google announced that Project Ara had been cancelled. This idea of the modular phone was undoubtedly influenced by the history of the personal computer. The original IBM PC introduced modularity to personal computers by building them on a hardware “bus” where systems could be expanded via add-on cards that were user installable. In fact, the entire computer was easily put together from parts—the power supply, motherboard, case, display, video card, microprocessor, memory modules, etc. were all available for purchase separately. I put a few together myself during the 1990s and it was a hobby for many. But the vast majority of people did not want to bother with building their own computers. The benefit of modularity was mainly for PC OEMs who took advantage of this modular architecture by sourcing parts and doing assembly on a just-in-time basis—as consumers placed their orders online. This “have-it-your-way” flexibility was what modularity enabled. It also meant that various sub-components like video cards and microprocessors could be improved at speeds different than those of hard drives or memories. Assemblers did not need to wait for any single improvement to continue offering a better product. The results were a tremendously rapid adoption of the product. Over a billion people became computer users in a matter of two decades. When the smartphone emerged as a new computing form factor, it made sense that modularity should eventually take root. Recall that early computers, like early smartphones, where integrated products. The PC emerged after decades of mainframe and minicomputer evolution. The Project Ara visionaries saw this stage of modularity arriving and sought to enable it. So why has Ara failed to even reach a market launch? Before we continue, we need to recall another chapter in the history of the PC: the laptop. Portability was a concern for the PC from its earliest years. Compaq was a PC company founded on the premise that its computer could be transported. These portable PCs had tiny screens and could not be expanded as easily (limited space for ports), but the value of portability trumped the compromises. Compaq was on to something. Their luggable evolved over the years and eventually the “laptop” form factor was popularized. While the expandability of early laptops was very limited, they became increasingly smaller. To achieve this, engineers had to customize the subsystems for the constraints of the space and power of portability. But it came at a cost: $8,500 in 1985 dollars. Progress followed quickly, however. By the mid 2000s, laptops were the most common form factor for PCs. And, by then, competitiveness in laptops came from more integration rather than more modularity. Across the industry, computer makers moved toward a new definition of performance—portability rather than raw power—which led to a re-integration at the hardware level. Eventually, this was also commoditized and the PC integration effort was outsourced to (typically Taiwanese) original design manufacturers (ODMs). ODMs provided designs and sometimes manufacturing to the original equipment manufacturers OEMs, who instead focused on marketing and support. This process of integration followed by modularization followed by re-integration and re-modularization is synchronized to a clock cycle in which performance is redefined. In other words, if the basis of competition changes, then the need for integration emerges. If and when the basis of competition stabilizes, the need for modularity returns. When the job of “computing” became attached to wireless communications, it was smartphones who took on the challenge. The smartphone era was initiated by integrated offerings from Blackberry, Nokia and Apple. It was not initiated by the modular alternatives of Microsoft’s Windows Mobile or by early versions of Mobile Linux. Google and Microsoft’s offerings of mobile operating systems enabled scale quite a few years later by separating hardware from software. But even then the hardware designs remained an integrated effort. This is when the idea of Project Ara came about. The bet was that hardware would increasingly become modular and what was needed was a “bus” architecture akin to that of the original IBM PC. Google believed that that the time of hardware modularity for phones was approaching and someone had to define the standard. However, the idea has merit only if the definition of performance remains largely unchanged and if modularity offers benefits to both consumers and producers. Recall that the modular PC had a valuable proposition for consumers who could expand systems and for producers who could focus on marketing and fulfillment rather than engineering. This confluence does not always appear. Consumers are on a certain cadence of involvement but producers might well be on another. An architecture is marketed to both, but they have to both agree that it’s valuable for it to be a success. Although modularity was very attractive to late ‘90s PC makers, buyers were shifting towards valuing the integrated laptop. Manufacturers followed at varying speed. Apple was a big beneficiary of the shift as it was the most attuned to integration. The consumer and producer diverged not long after the PC modularized leading to a re-integration phase. So in order to be confident that modularity (at the hardware layer) for the phone is upon us, we have to ask not only if buyers are no longer seeking—and indeed are over-served—by the integrated product. We also have to ask if OEMs would benefit from being module suppliers or module assemblers. Within the addressable market for licensees of Ara, Apple can be excluded and Samsung is extremely unlikely to concede architectural controls (especially as it has a large business making components and is chafing at not having control over Android.) The remaining makers could benefit from modularity as they would be able to outsource engineering and design. But, they don’t have the market reach to establish a new standard. Modularization is a two-faceted force: for vendors, it enables a divide-and-conquer approach to problems of production, development and marketing; for buyers it enables conformable, adaptable adoption. This push/pull force is what enables rapid change and acceleration of growth. So for modularity to work, it needs to offer benefits of collaboration to producers while simultaneously offering flexibility to buyers who are over-served by integration. A modular hardware (in addition to a modular software) computer may be conformable to buyer behavior but it may not offer opportunities of collaboration to producers; or vice versa. 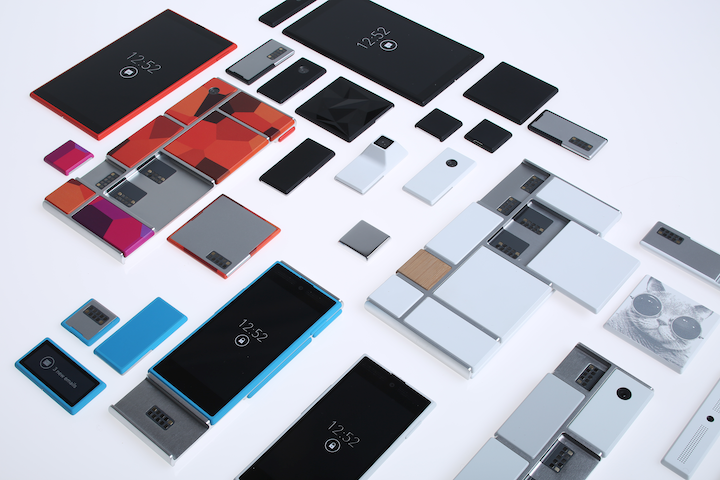 The demise of Project Ara is not a testament to the demise of modularity. Modularity is abundantly evident throughout the smartphone business ecosystems. Millions of apps act as modules that enable completely different experiences for users of the same device. There are a vast set of accessories available through a myriad of interfaces such as bluetooth, USB and WiFi. The hardware subsystems are provided by a multitude of suppliers, and the products are assembled by various contract manufacturers. Project Ara was an attempt to offer a particular interface across a boundary inside a device, but it offered no incentives to those who built devices or components. In contrast, apps offer interfaces “on top of” the device and offer great incentives for experimentation on solving pressing user problems. Modularity isn’t a theory that all boundaries should be open. It’s an observation that value chains evolve. How and when they evolve depends on an understanding of buyer behavior and producer incentives.